Distinctive features: Woody Vine; Compound leaves. 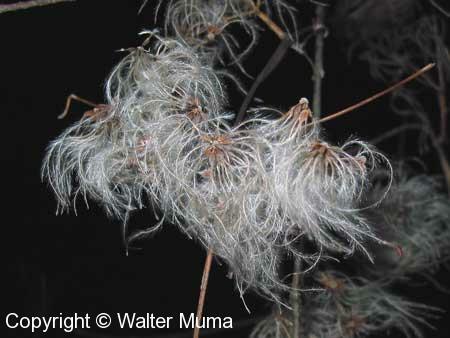 Distinctive fluffy seed head persists into winter. White 4-part flowers.  Trumpet Creeper (Campsis radicans) - larger leaves, bright red large tubular flowers.  Purple Clematis (Clematis occidentalis) - purple flowers. 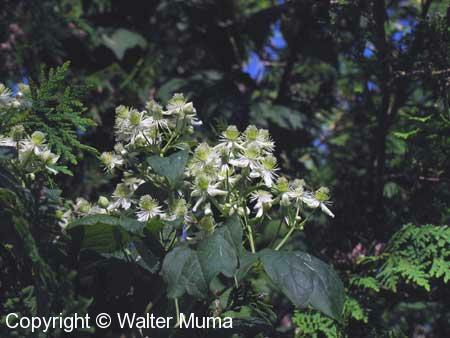 Flowers: Summer; White, Green/Brown; 4 parts (petals); White, 4 petals. Leaves: Opposite/Whorled, Compound, Toothed; 3 leaflets. Fruit/Seeds: fluffy head, persist into winter. Habitat: Fields and Open Areas, Wet Areas; Clearings, edges of forests& thickets. Photographs: 130 photographs available, of which 10 are featured on this page. SCROLL DOWN FOR PHOTOGRAPHS. 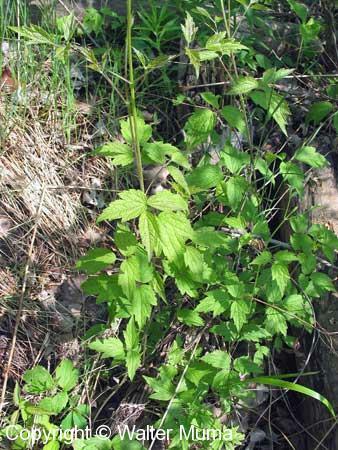 An overview of what this vine looks like. It twines a bit over other vegetation. Closeup of the compound leaf. It has 3 leaflets. The leaves are opposite. Flower buds in late July. 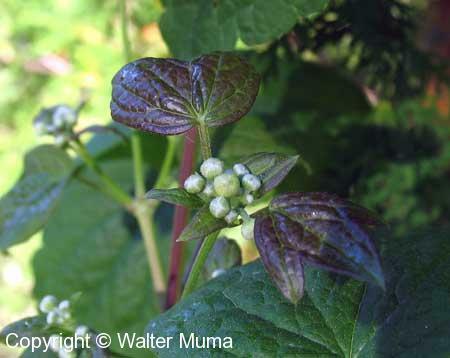 The flowers appear in late July - August, sometimes into September. These flowers are just opening. Full open flowers. They have 4 white petals. The fluffy seed heads in late August. There may still be flowers on the same plant that has seeds. The fluffy seed heads, dried out and still on the plant in late January. Another view of the seed head in winter (December).